This pocket-sized book has a fair amount of content thanks to an unusually small font size – and the subject is one that is quite topical when this review was written given the furore over the cyclist Lance Armstrong’s use of performance enhancing drugs. Allen Buchanan takes on the whole subject of human beings enhancing ourselves. 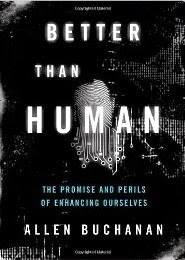 It’s an interesting book that makes quite strong arguments that augmentation, both through use of drugs and genetic modification, is going to happen whether we like it or not, and shows how many of the arguments against such an approach are based on poor reasoning. Buchanan recognizes the issues and the ways this will cause problems, but equally dismisses many of the arguments against doing so. He also points out that the use of drugs in sport is actually a bad example (sorry), as in most circumstances we aren’t playing games and we aren’t in a zero sum competition. If one person is enhanced it has the potential to benefit the rest of us, rather than being a threat. There are some quite serious issues. Early on, Buchanan rather condescendingly points out that this is the simplified version and he has a serious book on the topic for academics. That puts us in our place. But more to the point, I am not sure he has managed to leave behind his academic approach, making the book a little stilted sometimes and too focused on shooting down various academic arguments. I was also quite disappointed that unlike my own Upgrade Me, he makes no mention of anything other than biological enhancements, where many of the most important ones are non-biological. Take two simple ones. If I hit someone with a stone in my fist, I enhance my ability to hurt them beyond human. If I use a water bottle when crossing a desert I am enhanced in my ability to survive. It is very arbitrary to limit yourself to drug and genetic modification. In some ways, then, a frustrating book – but nonetheless a very useful guide to the arguments for anyone worried about anything from drugs in sport to those who want to enhance their intellectual ability.